This article is not supposed to be a manual for vlfrx-tools (because there already is a very good manual), nor for unix/linux systems (because there is a lot of good documentation for them too), it’s a description of my setup, which yields useful results. Please refer to previous articles for the hardware setup: the VLF signal is sampled using an external Creative EMU-0204 USB sound card, the sampling rate is compensated using a 1PPS signal from a GPS receiver. Before installation one should read the vlfrx-tools user manual. We are installing to /opt/vlfrx , because we want all files to be in one place, so that we can easily remove or upgrade them, or move them to another box without a compiler. The vlfrx-tools software follows the unix philosophy: it consists of many small programs, everyone of which has one clear function, it’s up to the user to connect them together to do whatever he wants. Interfacing the programs cam be done in the thaditional unix way using pipes, but also using circular buffers. It important to read how the vlfrx-tools buffer interface works. To keep things simple we’ll run the software as the root user (it would be more elegant to make an unprivileged user which would have full access to the sound card etc). In case of the EMU-0204 USB sound card the device is visible as the hw:1,0 device in the ALSA subsystem (hw:0,0 is the internal sound card in the laptop). The EMU-0204 card can only sample at 24 bits per sample (other sound cards can also sabple at 16-bit and 8-bit depth, the bits per sample is set using the -b parameter to vtcard). The hardware setup is described in the Simple setup for monitoring of VLF signals using vlfrx-tools article. A lowpass-filtered 1PPS is connected to the L channel, while the R channel is connected the VLF signal from the antenna. One sould read the documentation how the stream can be marked with 1PPS and resampled using this information. The 1PPS signal should look similar to Fig 1. Please pay attention to the Resolution, Trig Level, Pre-trig settings, the meaning is the same as in an oscilloscope. znaczenie jest podobne jak w oscyloskopie. 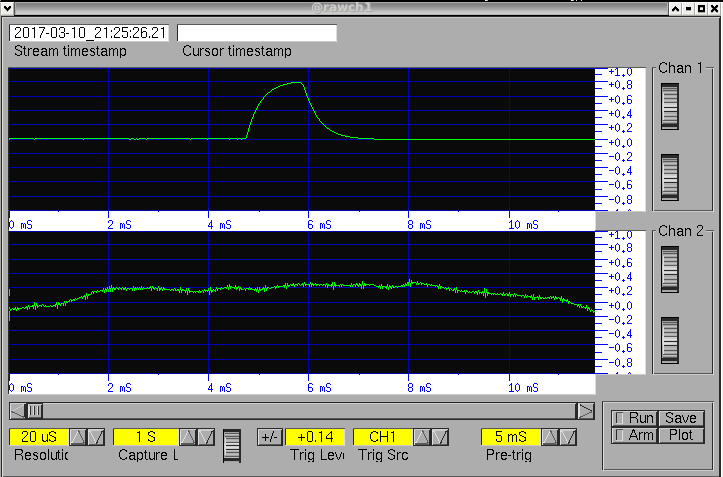 The 1PPS level sould be set to about 80% of the ADC resolution using the level knob on the sound card. The buffer @output1 contains a signal which is resampled to exactly 48000 samples per second. WARNING: the /mnt/rawvlf directory will get bigger with time. Older files should be deleted so that you don’t run out of disk space (this can be done by hand or using a simple script). The /mnt/rawvlf directory is an example, one should use a directory on a filesystem which has adequate free space. The /tmp/out.png file contains a 20 second spectrogram with 100 pixel/second resolution. echo -n "$i start: `date`"
The following script extracts the desired interval from out recording repository, filters a 3000Hz band centered on our receive frequency, feeds it to a noiseblanker, and resamples it to a 240 samples/second stream. The data is saved in the file set by the $PLIK variable. The file contents are later passed to vtraw and ebnaut for decoding. One should set the TT variable (the timeperiod which is being analysed), FREQ (the frequency in Hz), and PLIK (the filename containing the extracted 2400sample/second stream). The receiver output is saved to a file, so that one experiment with running ebnaut on it with different parameters. 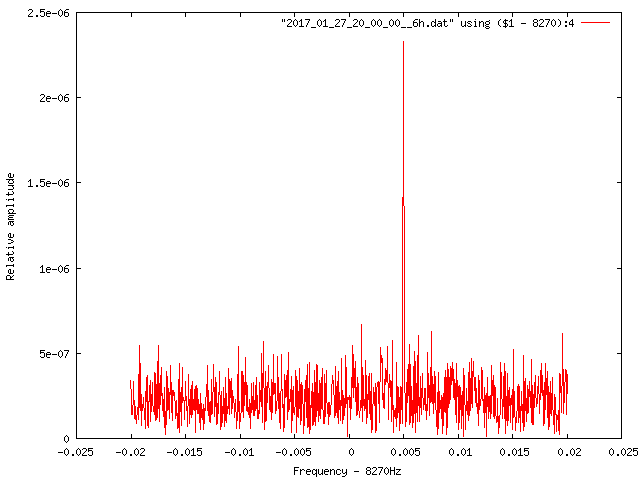 Record distance for a VLF transmission from an earth dipole antenna.